Here is another fabulous idiom of the day video from Richard Ford. This time, Richard explains the meaning of the common expression to kill two birds with one stone. There are those who feel that this particular idiom isn’t very pleasant seeing as it is associated with the hunting and death of birds. Others even regard it as offensive and an embarrassment to the English language (read more). Some people even prefer to create their own animal-friendly version of the expression and some languages actually have expressions that mean the same but don’t actually involve killing birds. Watch the video below to see Richard’s explanation, then scroll down for more examples and some ‘alternatives’ from around the web. Please ‘Like’ or share this video using the tabs on the left<===. Idiom of the day. To kill two birds with one stone. To kill two birds with one stone means to complete two actions in one. So, I decide to go to the gas station, buy some gasoline and buy a present for my mother; perhaps some flowers. Therefore, I have killed two birds with one stone. So, can you think of a time when you have killed two birds with one stone? Please let us know and leave a comment, we’d love to hear from you. Thank you. As Richard states in the video above, to kill two birds with one stone simply means to complete two actions in one. Essentially, you are solving two objectives (perhaps a problems, a task or a challenge) at the same time or with one single action. 1. Whenever I’m doing the housework, I like to listen to English language learning podcasts. That way, I kill two birds with one stone; my house gets clean and tidy and at the same time my English language skills improve. 2. 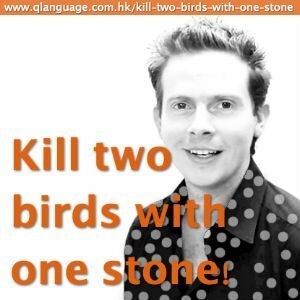 I killed two birds with one stone when I was on an Intensive Mandarin course in Hong Kong last week. After studying Chinese all day, I made sure to catch up and relax with at least one old friend in the evening. There are conflicting opinions as to the origin of this particular idiom – as is the case with so many common English expressions – but here are a few possibilities as to where the idea of killing two birds with one stone first originated. Choose for yourself which one seems the most plausible. This is a Chinese saying: yi shi er niao (一石二鳥)which literally translates to “one stone two birds”. There is also another Chinese saying that goes yi jian shuang diao (一箭雙雕)which translates to “one arrow double vultures”, the usage of which is the same. In the Greek Mythology tale of Daedalus and Icarus. Daedalus is held captive by King Minos on Crete in a high tower. All he is able to see are high walls around him and large birds overhead awaiting his and his son, Icarus’ demise. Daedalus devises a plan to throw stones at the birds in the hope of fashioning artificial wings to enable the pair to fly home. He finds, with his stone through a clever throwing motion, that he is able to strike one bird with the ricochet hitting a second bird, thus killing two birds with one stone. The rest is history. This idiom dates from the 1600s, and it was initially used in a somewhat pejorative way, to describe a philosopher’s attempt to prove two arguments with a single solution. The implication was that killing two birds at one time is extremely challenging and unlikely, and that the philosopher’s attempt should be viewed with extreme suspicion. The philosopher had obviously failed to satisfy his critics, who suggested that his attempt was about as successful as a try to knock out two birds with a single stone. Over time, “to kill two birds with one stone” has come to be used more generally to accomplishing two goals at once, and the negative connotations have largely vanished. In fact, people are encouraged to think of ways to accomplish it, thereby living much more efficient lives. This is especially true in the business world, where employers are constantly on the hunt for ways to cut costs and improve efficiency, so something that kills two birds with one stone could be quite useful. The website Ticklebugs.com once held a competition to come up with an alternative way of saying the same thing but without mentioning the harming of birds. Free two birds with one key. Mash two potatoes with one fork. Flutter two hearts with one look. Let’s pull two weeds with one yank. Water two plants with one hose. Get two giggles from one tickle. Tickle two tummies with one finger. Can you think of any better ones yourself? If so, let us know in the comment box below. prendere due piccioni con una fava, which literally means to catch two pigeons with one lava bean. matar dois coelhos de uma cajatada só – meaning to kill two rabbits with only one cane-blow. Poor rabbits! mit einer Klappe zwei Fliegen schlagen – which means to kill two flies with one swat. Do have a similar expression in your language or do you know of any expressions like these in other languages? ← Idiom of the Day – No big deal! “To pat two cats in one lap.” The idea is that cats as pets need love, but if you have more than one cat, this can take a lot of time. If you can do two at once, then you have accomplished two objectives at the same time. By the way, depending on your cats, petting two in one lap is not that easy to do! “Feed two birds with one scone” is my favorite. I don’t have another expression like this one in my other language, but I’d like to comment on this article. It is well written, and the facts are nicely picked out. Overall, I think that this article is juicy, since it is brimming with great details. It is well organized, and it definitely is well developed. I like the expression kill 2 birds with 1 stone, and I even decided to write a essay on it. The troubling thing is that it is missing some details that I need for my essay! Everything else is spot on! Way to go! I actually did kill two birds with one stone. A good hunter will line one burn up behind another one when shooting the straight line. With a rock flipper I did such and hit both birds with one stone thus completing the task with one rock. Kiss two birds with one pair of lips.